as well as those artists already familiar with the world of fine art printmaking. 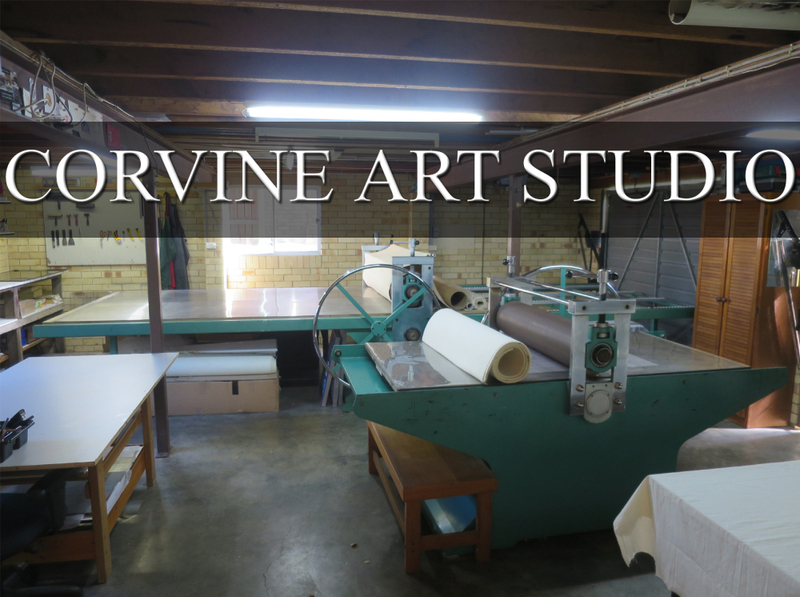 Corvine Art studio has two operating etching presses made by Andrew Reardon, Artequip Pty. Ltd. The large format press in the background has a 3.85 meter long by 2 meter wide bed. During 2015 a 7 meter long print was taken from mulptiple wood-blocks using relief technique. In foreground is the smaller press with a bed 1 meter wide and 2 meters long. David's large 4.5 meter long drawing pictured above was kindly photographed by Alex Shaw, Woolloongabba Art Gallery Director, 2017. Entitled 'This' is Australia!, the massive mixed media work was an engaging introduction to the exhibition, Austalian Anosognosia. The majority of the artworks were etchings, in particular, intaglio pulled, a la poupee and multiple block prints. An artist book and small sculpture completed the body works. This show was the visual component for a Doctor of Visual Arts submission to the Queensland College of Art, Griffith University.